Grossberg, Josh. “First Spooky Concept Art for Netflix's Chilling Adventures of Sabrina.” Syfy, SYFY WIRE, 22 Dec. 2017, www.syfy.com/syfywire/first-spooky-concept-art-for-netflixs-chilling-adventures-of-sabrina. 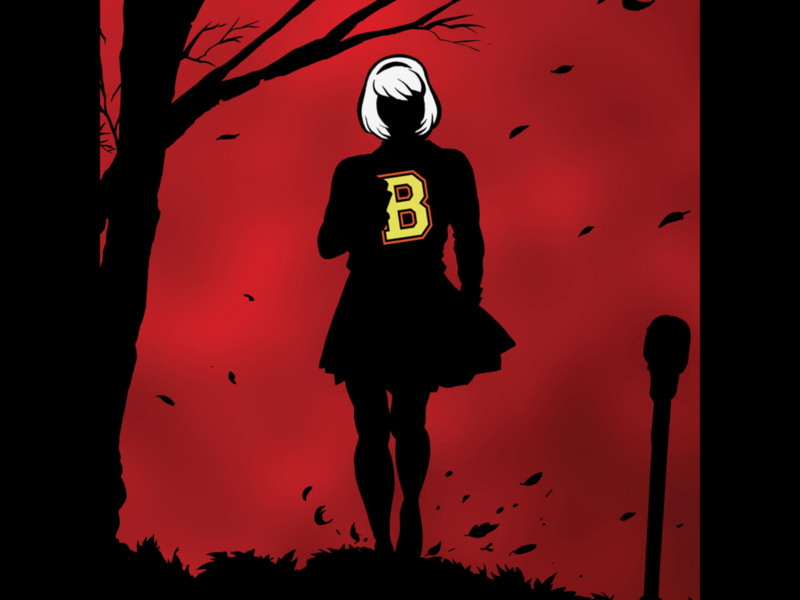 Chilling Adventures of Sabrina is a 2018 horror fantasy television series adapted from the comic book series of the same name. It follows Sabrina Spellman (Kiernan Shipka), a half-witch/half-human who must learn to navigate life as a teenager. She lives with her two polar opposite aunts, Zelda (Miranda Otto) and Hilda (Lucy Davis), and her voice-of-reason cousin, Ambrose (Chance Perdomo). She’s also joined by her closest friends, Roz (Jaz Sinclair) and Susie (Lachlan Watson), and her boyfriend, Harvey (Ross Lynch). On Sabrina’s sixteenth birthday, she must partake in a “dark baptism” and attend a witch academy in order for her to become a complete witch. However, Sabrina soon finds out a normal human teen life may be more fitting than life as a witch. Where as the witches want to spread hatred and fear upon mortals, Sabrina prefers to comfort her friends and spend time with her boyfriend. After she runs away from the baptism, a witch trial is held to decide Sabrina’s fate. She is granted to stay in the mortal world and continue going to school but must also attend the academy in the afternoons. The many side plots that follow the human characters are irritating and a little too preachy at times. For example, in the first two episodes, there are cases of sexual assault and harassment involving Susie and a group of jocks. Roz then tries to start a club for women supporting other women, which the principal denies. Sabrina uses her powers to put the principal into shock (stay with me) so he takes a day off. The girls then get the club approved by the vice principal and “live happily ever after”. The writers used this situation as a way to have a message about identity, sexuality, and feminism that feels incredibly out of place. Having a message to relate to a younger demographic fails to be understood if it is not weaved realistically into the main storyline. The entire show seems to forget about this situation after the second episode. Susie’s identity crisis still remains as her only motive throughout the show, but the club completely disappears from the universe. In another example, Harvey has family problems involving an abusive father that isn’t technically composed poorly, but improvements could have definitely been made. Without giving away major plot points, an accident causes Harvey and his father to confront their problems concluding in the penultimate episode in an anticlimactic climax that doesn’t even resolve their issues. It leads to the darkest moment in the show that doesn’t even relate to the witches. It could be argued this was a poor choice that only makes the characters more sorrowful and regretful, but it felt fitting. Because everything goes wrong for the characters, they can only get better from there which is why the finale is so powerful to watch after seeing all the characters go through the worst possible situations in their lives. A highlight of the show is its varied supporting characters. Each character does feel unique in his or her own way, but unique doesn’t always mean good. A character like Sabrina’s teacher (who’s also a witch), Miss Wardell, is written as an eccentric, Addams-Family-esque character mentors for Sabrina. But what makes her so special is the uncertainty of her actions at all times. You’ll never know if she’s actually trying to help Sabrina in her “quest” or only serving her own goals of evil and destruction. Again, without spoiling anything, I’ll say that Miss Wardell may become the central antagonist of the second season. The first season’s finale set itself up for an intense second season. Unfortunately, many other characters lack the charisma and intriguing nature of Miss Wardell. Even more unfortunately, all these said characters are from the magical side of the show. There are three female bullies who attend the academy who, to put it bluntly, discriminate against Sabrina (because she’s a half breed) to the extent of actual torture. It’s brutal, and not in the way Harvey’s story felt, but in the way where you feel hopeless and helpless to do anything even though there’s a perfectly good way to resolve the problems. And then there’s Nick. Nick is not only the worst character in the show but quite possibly one of the worst characters on television in a very long time. He’s a warlock (male wizard) who, for all purposes, has no point in the show. He continuously stalks Sabrina, tries to get her to break up with Harvey, and butts his head in situations that he has no reason to be in. It’d be fine if he was an enjoyable person, but no, he’s not. He’s creepy and perverted and stops at nothing to please Sabrina in an attempt to date her. He’s sickening! It’s a shame and really confusing that the same writers who could create all these characters that add so much heart and atmosphere to the show also wrote characters with no redeeming qualities and who are, even worse, pointless. For fans of Riverdale, you’re in luck. Both shows originated from the Archie comics and are possibly part of a connected universe. However, besides the same origins and similar aesthetic, that’s where the similarities end. Riverdale has often been criticized for a gratuitous use of melodrama that offsets what should be a more comedic, enjoyable show. But in Sabrina, the writers know how far their drama has to go before it becomes oversaturated. They knew the limitation of what’s deemed serious in a world where witches live among humans. Luckily, the dark tone is also complimented by a comedic edge that assists the exposition. In a very enjoyable (yet slightly mature) scene, Zelda gets irritated by Hilda, murders her, buries her in soil that will later resurrect her, and walks off so nonchalantly you can’t help but laugh. This not only gives a light-hearted take on a seemingly dark situation, but it also sets up the soil as a later integral plot device. Most of the episodes had a very episodical feel instead of one arching linear plot. There definitely was a consistent plot that was added to and expanded upon to create a realistic atmosphere (as realistic as witches can get), but every episode seemed to forget the contents of others. In the second episode, the High Priest who will initiate the baptism becomes the central antagonist of Sabrina and her family. But in the next episode, we view a courtroom story where the characters reasonably disagree and try to win the case in a mature manner. Wouldn’t it be so much more intense and captivating to see their conflict play out in a witch-on-witch battle reminiscent of Harry Potter? Speaking of Harry Potter, that’s the best way I can describe it: a Harry Potter clone. From the “chosen one” narrative to the quirky and memorable side characters, this show is a complete match. Both create dynamic consequences for the characters’ mythical actions as they relate to the human world. The human characters are given personalities, but more as a collective whole rather than as individuals. By the end, you pray the humans won’t get hurt because you can see the importance of them to the main characters. They feel they may not be able to go on without these people who witches have been taught to hate and demoralize since birth. And that’s where the writers are able to relay the message to the audience that also progresses throughout the story. Our central magical characters must learn to overcome the hatred they’ve become accustomed to and challenge the morals of all witches by showing that respect and care are the only reasons someone would need to accept another person as equal in all ways. Now, if the show was able to emulate this type of care for its message in b-plots without making it seem overambitious, it’d be a much more enjoyable show. But, even with the awkward characters or clunky morals, the show is still enjoyable enough for a teen audience to sit down and binge watch with their friends and simply have a good time. Better shows have been made, but Sabrina’s still acceptable for who it’s made for.